I remember going to a carnival one time and they were selling big cookies like these. They were charging $5.00 a cookie. 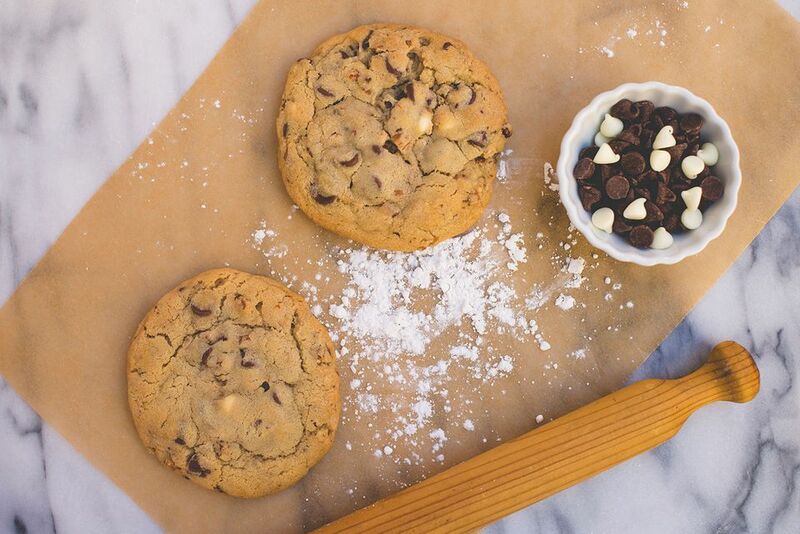 You may want to do the same in your next bake sale. Depending on your target customers you may wish to lower the price to $3 or $3.50 a cookie. This recipe is from the the 2008 cookbook 101 Easy Peasy Cookie Recipes. Permission granted for usage of this recipe given by the cookbook authors Lucinda Wallace and Heather Wallace. This recipe is from the 2008 cookbook 101 Easy Peasy Cookie Recipes. Permission granted for usage of this recipe given by the cookbook authors Lucinda Wallace and Heather Wallace. Preheat the oven to 350 F. In a medium bowl, stir together the flour, baking powder, and baking soda. In a large bowl, cream together the butter, granulated sugar, and brown sugar. Beat the eggs and vanilla extract into the butter mixture. Gradually stir in the flour mixture. Stir in the milk chocolate chips, semi-sweet chocolate chips, white chips and nuts. Drop the cookie dough by level 1/4-cupfuls, about 2 inches apart, onto ungreased** baking sheets. Bake the cookies for 12 to 14 minutes or until light golden brown. Allow the cookies to cool for 2 minutes on baking sheets, then transfer them to wire racks to cool completely. * I never use margarine anymore. I only use butter. Butter has the same calories as margarine and it’s a natural product. I also prefer salted butter. Although, unsalted butter is usually fresher, I don’t like the flat taste I get from baked goods made with it. ** I don’t know why, but baking with totally ungreased baking sheets to almost never work for me. I either lightly grease (spray and wipe off) a baking pan or use a silicon baking mat. The cookies don’t stick and clean-up is a breeze.